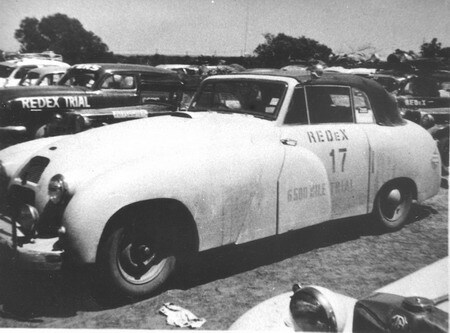 That original 1953 Redex Reliability Trial remains as a watershed in endurance rallies in Australia, up to that time it was the second longest trial ever staged in the world (the previous longest had been from New York to Paris in 1908). It was an expedition into the unknown. It was organized by Dunlop executive Harry James, who in 1904 had organized Australia's first motor race meeting, a four event "demonstration" at Aspendale racecourse in Victoria. James, who was generally regarded as the father of Australian motor sport, was also a great-uncle to arguably the biggest name to ever grace an Australian racetrack Peter Brock. It has recently come to light, when I was asked to identify a car, by the author of a coming book about the Redex events, that an Allard was purchased and prepared to run in Trials in Australia, However, not the type you would imagine, it was an M2X (Chassis No 2000.) and according to Tom Lush’s book the first produced, With the benefit of hindsight there could not be a more unsuitable car for such an event, given that roads in Australian outback were in the main unmade and composed of what the locals refer to as “bulldust” a red talcum powder like dust. Scanning the entry list it would have been undoubtedly the heaviest, and probably one of the most powerful cars in the field of around 200. 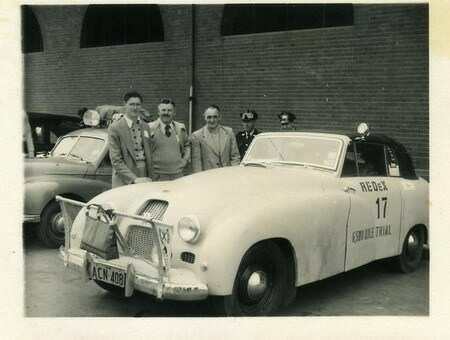 The car had been early entered in the 1953 Redex 1000 mile trial, but retired with a “broken” bonnet. This trial was 7.000 miles over some of the roughest roads you could imagine. Now over half a century ago, this was a time when even the relatively easy trip between Melbourne and Sydney (600 miles) was an endurance run in itself. There were very few Motels, and even fewer sealed roads. Even re-fuelling was a problem, it not uncommon for Service Stations to be over 600 miles apart (although Shell came to the assistance of the event, by placing petrol dumps of 32,000 gallons in four gallon drums around the 3000 mile stretch between Townsville and Adelaide). The course was virtually an “around Australia trip” and created so much interest, that a crowd estimated at 50,000 had jammed Driver Avenue outside Sydney Showground on August 30th to see the cars off. A further 150,000 lined the streets through Sydney’s northern suburbs to Hornsby to watch them whistle by on the early stages of their hectic motoring adventure. Great excitement had been generated prior to the Trial because life in Australia was finally returning to normal in these early post-war years. Additionally, the competitors were driving standard cars the public could relate to, Holden and Ford supporters were already locked in the fierce rivalry that continues to this day. Chryslers and Plymouths were entered, as were Jaguars and Humbers, among many other big cars. Drivers included the likes of Peter Antill, Jack Brabham, Lex Davison, Clive Gibson, Jack Jeffery, Stan Jones, Frank Kleinig, David McKay, ‘Gelignite’ Jack Murray, Eddie Perkins, Tom Sulman and Des West. It’s interesting to note that sons and/or grandsons of many of these drivers are carrying on their families’ motorsport tradition to this day. Two of the named drivers were J2 pilots, namely Jones (father of Alan) and Murray. Jack Murray gained the nickname of “Gelignite” as he had the habit (much to the concern of following drivers) of throwing live sticks of “Geli” out of his car, when things were getting a bit dull. During the 14 days of the trial, newspapers and radio stations were bringing to a spellbound public, terrific tales of daring driving, bush-bashing, high speeds, crashes, hardship and amazing ingenuity as 187 cars tried to conquer the harsh Australian outback. Which had quickly developed into a race, as the competitors realized that points (one point for every 15 seconds late into control points) were deducted for late arrivals, as well as losing 100 points for refusing to obey an official instruction, at the time there was no real speed limit, only advisory, the Police having to prove you were driving dangerously, so it was “drive as fast as you dare”. There were even reports of the police being called in to stop fights between rival garage owners, competing for petrol sales and publicity. Aussies all over the country were following blow-by-blow radio and newspaper descriptions of the long-distance reliability trial that had almost stopped the nation. The event was receiving huge media coverage of the kind that’s today seen only on rare occasions; such as the opening of an Olympic Games or a World Cup final. Except that the Trial lasted 14 days, not a mere few hours. 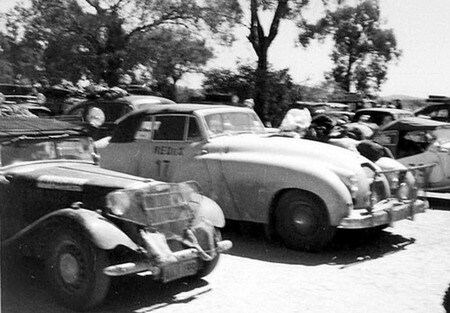 There is little recorded about Ray Neely and his Allard, however, when photographed at the Alice Springs, the car looks in remarkable condition. As reports indicate a number of cars had already been rebuilt or suffered major damage, with a penalty 500 points for replacing component parts during the trial, some had amassed quite a score already, so repairs were usually done out of sight under a gum tree. The Allard at Alice Springs well into the event. As far as results are concerned, we do know that the Allard finished with a points loss of 961 and no missed controls, overall placing was 96th outright, there being 129 finishers. Which is a good result, given the car was not designed to run on the bush tracks, which formed a large part of the route. The event was won by a Peugeot 203 with a loss of 19 points. Within days Peugeot dealers around the country had sold out. Makes you wonder what would have happened if the Allard had won? Nothing is further know of the history of the M2X following the event, its’ owner having passed away a number of years ago and his son having little recollection of the car. The three J2’s owned/driven by Trial competitors continue to exist, with Jones car (Chassis 1731) undergoing a major rebuild and being raced frequently in Australian historic events, Murray’s car Chassis No 1698 living a quiet existence in Sydney (Which I understand will shortly be offered for sale) and his other car Chassis No 1782 being sold into the USA.